Renaissance art. A jewel set deep in a natural setting, offering guests the relaxing atmosphere of the Tuscan countryside. Villa Le Maschere | UNA Esperienze is located a few kilometres from Florence in the Mugello Valley, a green basin crossed by the river Sieve, home to the artificial lake of Bilancino. The valley is the perfect destination for a relaxing holiday, taking full advantage of the treasures Tuscany has on offer: art, nature and good food. The extensive renovation work started in 2003 has restored Villa Le Maschere | UNA Esperienze to its former glory – a villa that is one of the most beautiful residences of the late Florentine Renaissance era. Today, the resort’s rooms safeguard invaluable art treasures, buried for years under layers of plaster: imposing sculptures, lavish floral decorations, Venetian composite flooring, and beautiful frescos. The 65 rooms at Villa Le Maschere | UNA Esperienze differ from one another in their furnishings, fabrics and colours and maintain, where reclamation has been possible, the original stucco, frescoes and decorations. Elegant and refined, rooms are split between the main villa and the Chini wing, and all offer full modern comforts: LCD TV, Wi-Fi connetion, safety box, minibar and air conditioning. Elegant – 16-28 sq.m., double bed or twin beds, en-suite bathroom with bathtub or shower. Superior – 20-33 sq.m., double bed or twin beds, bathtub or shower, views of the park or of Lago di Bilancino. 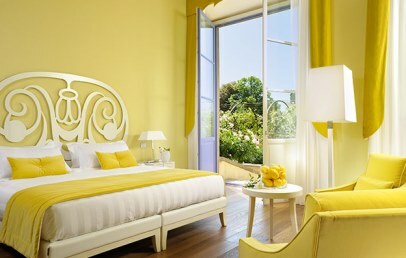 Junior Suite – 21-41 sq.m., double bed or twin beds, bathtub or shower, some rooms have private access to the garden. 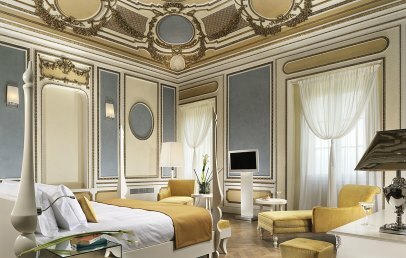 Junior Suite Prestige Collection – 44-68 sq.m., double bed or twin beds, bathtub or shower. 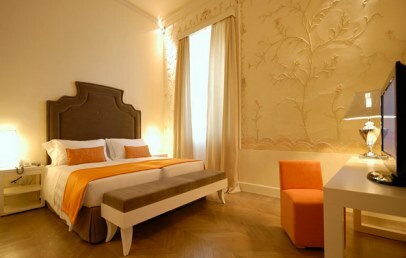 Suite – 37-51 sq.m., double bed or two large twin beds, classic or contemporary design. Housed in the former basements of the villa, the stunning wellness centre offers guests a hydro-massage tub, Turkish bath, sauna, sensory showers and relaxation area. Connected to the outdoor pool via three large stone arches, the wellness centre will take your breath away with its spectacular views over the Tuscan countryside. Children below 16 can access to the Jacuzzi only, under an adult’s supervision. During high season period, the hotel might ask to book the access in advance. The hotel’s restaurant Pipponero welcomes guests in a charming setting: the elegance of the grey tones and the sobriety of the architectural designs are key features of the indoor areas that boast large windows overlooking the stunning terrace where guests can dine during the summer season. Fully in line with product seasonality, the menu offers dishes that are both simple and refined and that celebrate the rich Tuscan tradition by adding a creative touch to the recipes. Included in the room rate: access to the wellness centre, the fitness area and the outdoor pools. Guests also enjoy free use of the Wi-Fi connection and the private car park. Laundry service, spa treatments and the minibar are all available at an additional cost. The shuttle service to/from Florence centre (timetable at reception) is free, and the transfer service to/from Florence airport and station are included in the room rate for guests staying in Junior suites, Junior Suites Prestige Collection and Suites. The municipality of Barberino di Mugello requires the payment of a tourist tax to be paid on spot. Split between the main villa and the Chini wing, Elegant rooms are decorated in a subtle manner and bring together classic and contemporary elements. The simple beauty of the furnishings goes hand-in-hand with the lively notes of colour in the fabrics, curtains and decorations that make each room unique. 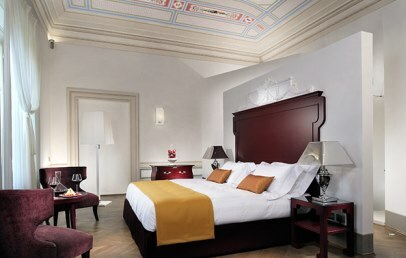 The bed is the key feature in each Elegant room, dominating the ambiance with an imposing headboard: stuffed and moulded, lacquered wood, or inspired by the works of the Florentine artist Galileo Chini. Connecting Elegant rooms are available. A classic and simple design, sober and elegant colour choices, comfort and functionality: Superior rooms are a refined place for relaxation, their ambience enhanced by the panoramic view over the large park and the Lago di Bilancino. Connecting Superior rooms are available. Junior Suites are split between the main villa (21-37 sq.m.) and the Chini wing (30-41 sq.m.) and are mostly located on the ground floor. Residence of the former owners, the rooms in the villa have lavishly frescoed ceilings and offer a refined and relaxing atmosphere. The soft shades of the surfaces go hand-in-hand with the elegant Baroque minimalism of the furnishings. 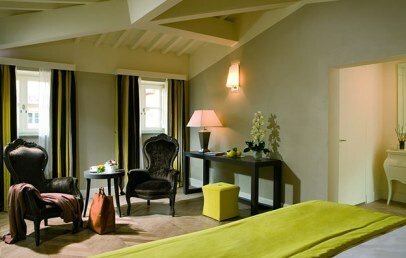 The Junior Suites in the Chini wing are an elegant haven of fresh and refined design. The rooms have private access to the Italian-style garden that surrounds them and offer Liberty-style majolica bathrooms created by Manifattura Chini. Connecting Junior Suites are available. The Suite Marchesa Liliana Suite is located in the Main Villa and offers a refined Baroque design: the beguiling sumptuousness of the walls and ceiling is only slightly cushioned by the contemporary touch given by some of the furnishings. Glass and gold leaf tiles as well as warm beige colour on the walls, shape this very elegant bathroom (29 sq.m.). In the middle of the bathroom is a large shower and a Whirlpool for two. This suite has double sinks and separate toilets. Moreover there are two LCD televisions, one in the bedroom and one in the bathroom.